Weather:60 degrees, Clear with a full moon. This couple celebrated their 14th wedding anniversary by taking their first boat ride together and we couldn’t have had a better night. 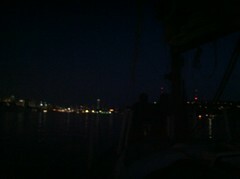 Great winds, clear sky and sailing by the light of a full moon. 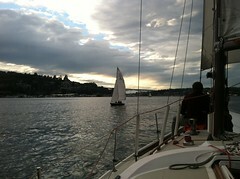 Great fun on this 6 person day sail with plenty of wind and a beautiful sunset. 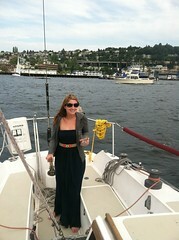 Everyone took turns driving the boat and did great. Weather:73 degrees, Clear and sunny. A fun group of people. Gery drove most of the time, it was a treat to for both me and him, he owns a Sanata 20 similar to the one in our boat club. 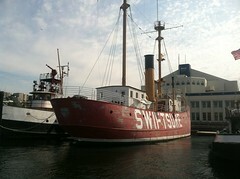 We had great winds and a sunny tour of the lake. The best way to spend a Sunday afternoon. Grab some friends, some drinks and snacks and head down to the boat. That is exactly what these girls did. And they all had a great time. as you can tell from the pictures. 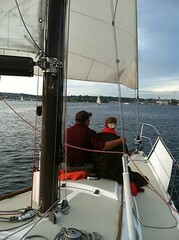 A great couple and a wonderful evening sail. We started their evening by setting up dinner at Cuoco. 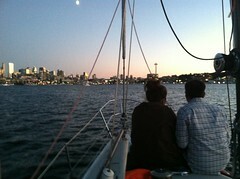 Then they walked a couple blocks to south Lake Union where we picked them up to watch the sunset. 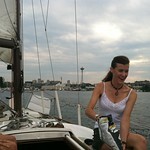 It was a beautiful evening and they both took a turn steering the boat, which they did great! 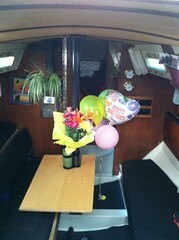 It was a pleasure to have them on the boat. A beautiful day and a surprise. 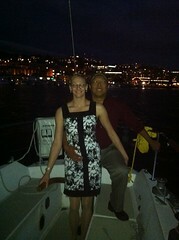 Neither of these two has even been on a boat and he popped the question on the boat! She said yes, it was wonderful! A double date on the boat, these lovely couple decide to bring their own food rather than eating out, they even made their own ice cream, Coconut cherry bliss. It was a fantastic evening. I keep the boat mellow until after all the food was put away. This was hard for me since the winds were great, but my patience paid off. 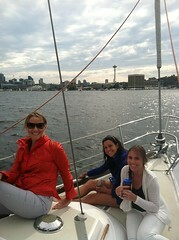 After dinner we stowed everything and then really went sailing! A couple laps of the lake, what a great time. Then I dropped everyone back off just blocks from his or her house. Sorry for the partial track, I forgot to turn it on. A great way to celebrate friendship. 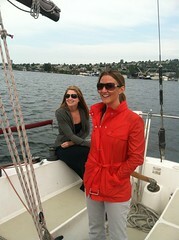 The Girls came prepared, and were even scoping out the boat for an overnight. We sailed around the lake in light winds, had some wonderful conversations under the night sky, and returned to the dock only minutes before it started to rain. Weather: 72 degrees, Clear with some clouds. This couple was wonderful. 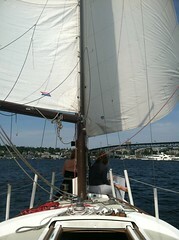 We picked them up at chandler’s cove, sailed around the lake, and Doug tried his hand at being are real mariner. Couple all that with great conversation, and glimpses of a sunset. What better way to spend the evening. All this sailing without using the motor! 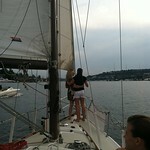 I love sailing.